For nearly 40 years, Dr. David Godschalk shaped how generations of planners and academics understand and respond to climate change, natural disasters and emerging land use issues. 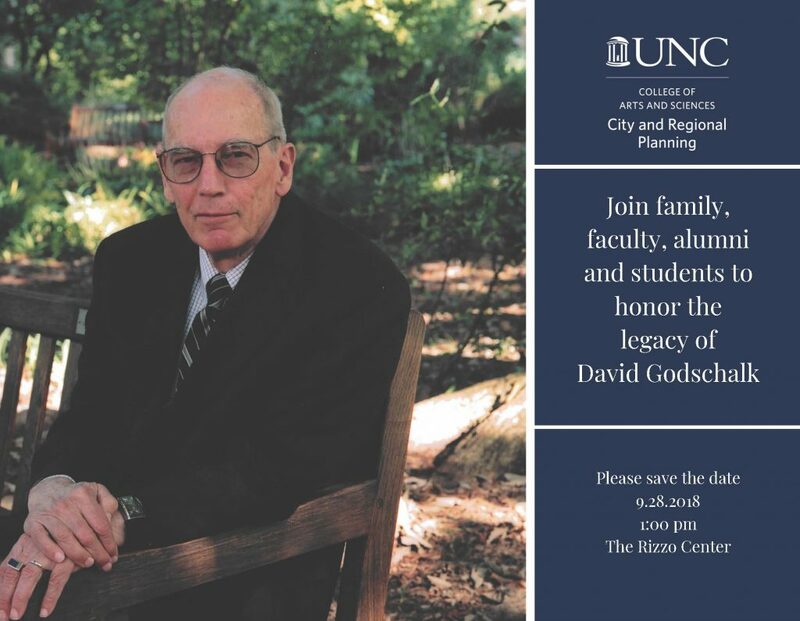 We invite you to join the College, Carolina Planning and Dave’s family for an extraordinary event to honor his legacy on Friday, September 28, 2018 at the Rizzo Center in Chapel Hill (150 Dubose Home Lane, Chapel Hill, NC 27517). Through decades of service to our campus community and our state and nation, Dave displayed a superb capacity to inspire, collaborate and build consensus. He received the highest honors in the field including the ACSP Distingihished Educator Award and the APA President’s Award and was named the Stephen Baxter Professor Emeritus. The symposium, cocktail reception and dinner event will be an remarkable opportunity to learn about his efforts, how Dave’s work influences current faculty research and to connect with alumni practitioners, faculty and students working to address the most important land use issues facing us today. Our special guest will be Dave’s longtime colleague, Dr. Philip R. Berke, Professor in the Department of Landscape Architecture and Urban Planning and Director of the Institute for Sustainable Communities at Texas A&M. There will also be a discussion with a panel of stellar alumni, including Ben Hitchings (MCRP ‘97), Director of Planning and Development Services for Chapel Hill and Past President of the North Carolina Chapter of the American Planning Association; Zorica Nedovic-Budic (PhD ‘92), Professor at University of Illinois at Chicago; and Leigh Anne King (MCRP ‘05), Principal at Clarion Associates; and John Cooper (Ph.D. ’04), Associate Professor of Practice in the Department of Landscape Architecture and Urban Planning and Director of Texas Target Communities, Texas A&M University. We miss his thoughtful and inspiring presence and hope that you will be able to join us to honor him just as he would have wanted. Tickets are $25 per person and include access to the entire half-day event and dinner. In line with his commitment to supporting the next generation of scholars, Dave and his wife Lallie Godschalk created the Godschalk Fellowship Fund to support Carolina Planning graduate students. Please consider donating in his honor. If you would like to contribute, please click here to make a gift today. You can also mail in a gift to the Arts and Sciences Foundation.